The Balloonatic Promotions - Balloon rides over Orlando! Today. Here is where you can catch the Balloonatic this year. If you live in or near one of these locations and would like to fly with the Balloonatic while he is in your area simply call us at 321-287-4466 and we can book you a spot. 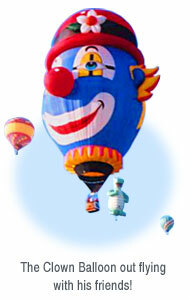 You can also get in touch with the Balloonatic while he is traveling by Email, (he actually has a lap top). August 25-27 Lewiston, Aururn, ME Never Ever Again !! Copyright © 2009, The Balloonatic Promotions. All rights reserved.